All services are rendered by professional artists and facilitators. The services offered are to supplement and invigorate existing communications channels, and to create new channels of communication within your organization. The BTTP communications’ solution is focused on involving and engaging with the participants/staff. No prior knowledge or experience in the performing arts is necessary for participation, and BTTP will bring all the necessary equipment for the session. No two companies have the same challenges, hence no one solution can be used for different companies. As such, the solutions which BTTP offers are flexible, according to requirements and individual budget limitations. 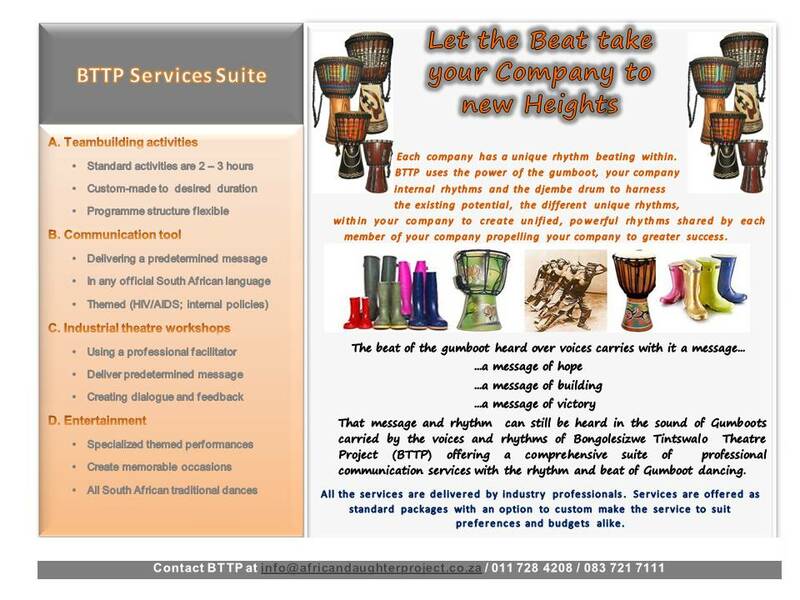 Past clients that BTTP has provided services for include Primedia, SANGONet, the Tourism Grading Council and Hollard. BTTP also performed at the 1st Touch Africa Tourism and Culture festival held in Beijing, China.